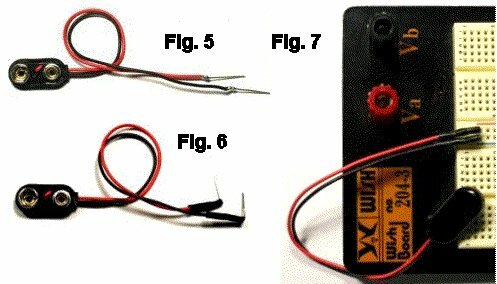 This article is meant for the beginning stompbox builder who wants to learn how a solderless breadboard works and how to use it for prototyping. 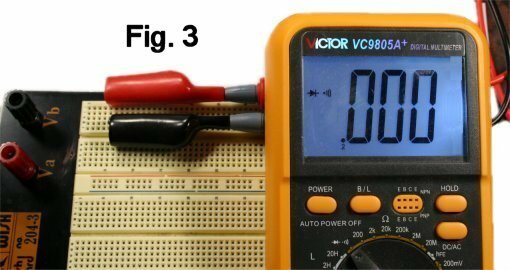 As a matter of necessity, I'll also show some basic functions of using a multimeter for continuity and voltage tests and introduce interpreting a schematic. From that point, subsequent articles will cover setting up various effect circuits. It works, but it doesn't sound "right." 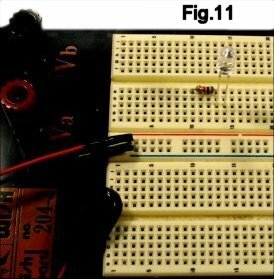 The solderless breadboard provides a way to set up a circuit for testing purposes without committing to a permanent build. It's the electronic equivalent of a kid's Erector set; components can easily be added or removed, and whole sections can be reconfigured as many times as necessary to get to a finished design. are typical of many that are available from mail-order shops. The plastic rails (often called "breadboard strips") are made in several sizes, and they can usually be snapped together to create larger arrays. For simple builds, a small strip like the one on the left is usually fine. On the right is a typical product that has larger strips attached to a metal base, convenient for bigger layouts. More complex and expensive versions exist, some of which include built-in power supplies and mounting brackets for controls. My directions will mostly be applicable to anything you buy, whether from my Stock List or anywhere else. How It Works - The "Bear Bones"
Within each hole in the plastic rail is a spring-loaded contact that will positively grip the lead of a component that you insert, but still allow you to remove it easily. Each column of five holes is connected internally (Fig. 1). It may help you get oriented by actually satisfying yourself that this is the case. Insert short lengths of bare #22 or #24 wire into any two holes in a column (Fig. 2). Now set the selector of your multimeter to the Continuity position (or the lowest resistance scale if your instrument does not have a Continuity position) and measure between the wires (Fig. 3). Do the test with the multimeter if you need to to be sure that you know what is--and is not--connected to what. While each bus in these breadboard is connected all the way across, I have seen models in which the bus is split in the middle; you have to connect the two halves together if you want continuity across the full length. You have probably noticed that the rows on each strip have letters and the columns are numbered. This "indexing" is sometimes useful for referring to specific locations, as we'll do later on. 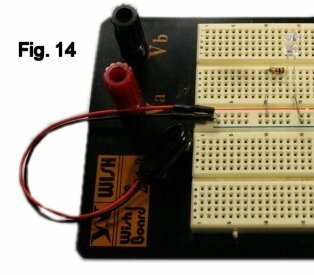 Let's begin by setting up a very simple circuit just to light an LED. This will demonstrate a couple of necessary points before we tackle an effect. 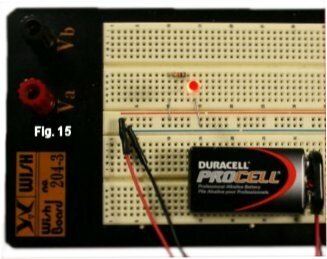 This breadboard has red (+) and black (-) binding posts for connecting power, but I usually use a 9-volt battery snap to which I have soldered a couple of plug-in leads. It's very easy to make. Pretty simple, right? A schematic shows the logical connection of components, but not necessarily the physical way that they are laid out. So let's lay this out on the breadboard. First, cut off half the leads from a 10K resistor (Brown, Black, Orange, Gold) and save the wire scraps for use later. Bend the leads flush to the body, and plug the resistor into any two convenient columns (Fig. 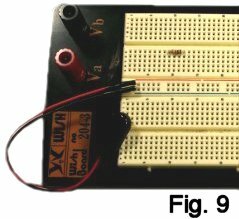 9); breadboarding is pragmatic and practical and does not have many fixed rules about what goes where. The LED is a diode by definition and so is polarized (Fig. 10.) Plug it in with its positive lead in the same column as the right-hand lead of the resistor (Fig. 11.) You have made the connection shown in Fig. 12. Got the idea? Now finish the circuit. Create a couple of jumpers from #22 or #24 bare stock (Fig. 13) and plug these in to make the connections to the power supply busses (Fig. 14.) Connect the battery (Fig. 15) and let there be light! For purposes of illustration, I squared the corners of the jumpers and made the hole-to-hole lengths exact, but neither is necessary for routine work; as I noted earlier, breadboarding is pragmatic and based on speed and convenience. Jumpers can be made from insulated or bare wire. Use insulated wire where there is any possibility that leads will short. Slice the outer jacket, remove a bunch of these wires, and you will have all you need for many moons of experiments. Are you ready to Rock and Roll? OK!! At this point, you can proceed to the article on Breadboarding A Silicon Fuzz Face. I will add other effects to this series down the road. Welcome, and let the Noise begin!